This is a re-post from April 2009. 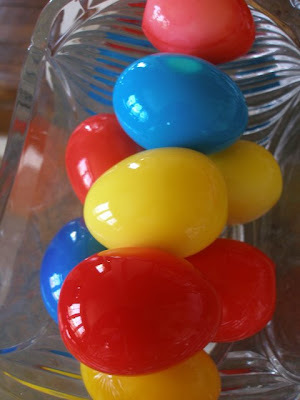 I wanted to remind you all of these beautiful and delicious eggs. Combine the vinegar, water, sugar and salt in a saucepan. Heat and stir until the sugar has dissolved. Divide vinegar mixture between at least three jars with lids, reserving a cup. 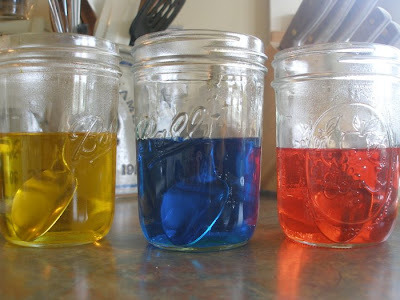 Add food coloring (6 or 7 drops per color) to jars. Add peeled hard-boiled eggs- several to each jar. Fill jars with reserved vinegar mixture. Cover and refrigerate for several days before serving. Grandma says they will keep for several months. Mine are not going to last several days. The eggs are BEE-YEW-TIFUL! What fun! Those are the finished eggs? they are sooooo vibrant,I love them. Hmm. I've never tried the ones from the store so I can't compare them. These are slightly sweet, but also tart/pickle-y. Sorry I can give you a more definitive answer. They're yummy. That I can say:-). These look so yummy! 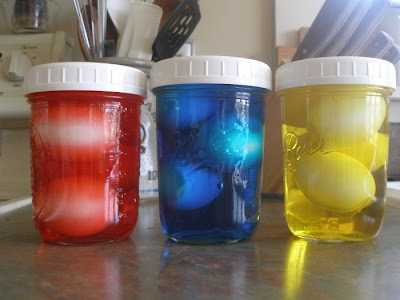 Growing up a friend's mom used to pickle eggs and I always loved them, even if my family didn't appreciate the unique taste. May I have permission to pin this recipe to my Pinterest board? Of course. No need to ask permission with Pinterest since my link goes along with the photograph, but thanks for asking all the same:-). Beautiful!!!! I've never had a pickled egg....or knew that you could pickle an egg. My Grandmother made them as well. But she used Pickled Red beets to pickle them. She peeled them first and put the Hard Boiled eggs in a large Ziploc bag with the contents of a can of Pickled red Beets. I don't like Pickled red beets but I LOOOOOVE Grandma's Pickled Red Beet Deviled Eggs. She would let them sit in the refrigerator for 3 days taking them out each day to move them around to make sure they got equal exposure and then Devil them with Miracle whip, Yellow mustard, Sea Salt and black pepper and Paprika, garnished with some more Paprika. We still have them on every holiday. Or when we cant wait any longer!